I went back to New Zealand for a visit earlier this year. I had a lot of fun going though all my old boxes, my wardrobe and my dresser throwing out lots of things, choosing what I really want to keep. My dad had been a bit annoyed about all my stuff still being in my old bedroom (it was basically untouched for, oh, 13 years) but I managed to empty it. I even found all my old payslips from when I worked at KFC during high school. And my old bank statements from the same time period. It was quite hilarious/shocking to see how much I spent on fabric back then!! Half of my pay check went on fabric! I wish I was exaggerating. (And I earned so little! Just over $5 an hour...) And then seeing how much of that fabric was still sitting in my wardrobe... (it is now mostly in my mum's stash because we have similar fabric taste). Nowadays I am really trying to not buy too much fabric because I have so much to use up and it takes up so much space. My style as a teenager was much more colourful and brave than it is now. I brought back with me a few of my old cardigans but the majority of pieces I just cannot wear anymore. 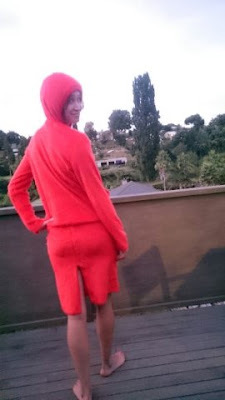 Like for example this fluffy, furry orange hoodie with gold bead string with a matching skirt from 2002. All of my skirts from about this time (early 2000s) seem to have these ridiculously high splits. They are quite obscene. I was even embarrassed wearing them in front of my mum for the photos. This pink dress was one of my favourites back in 2001. I modified a 70's pattern to make it. It's a little bit too tight now, made me feel too self-conscious, (and of course, another scandalous split...) so this one stayed in NZ. 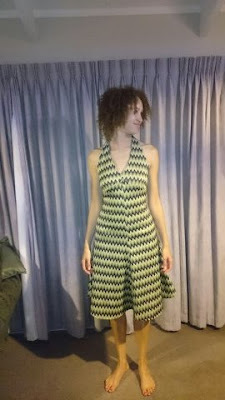 This green zigzag dress is made from the original pattern of the above pink dress. I think I made this one in 2000 when I was 15 or 16. Back then I didn't care about pattern matching. At all! I used to love wearing this with matching green tights. It's a little too tight for comfort now even though it's a stretch fabric. This next outfit is kind of horrifying. I almost didn't post this because it is so unflattering. I think I wore the skirt quite a bit but I am pretty sure the matching (hahahaha, what was I thinking?!) top never saw the light of day. I loved these blue pants to death. It was rather surprising for me to see how badly they are sewn. The insides are not finished at all. The waist is so high! They are from around 2000 when I was 15, the top from about 2002. 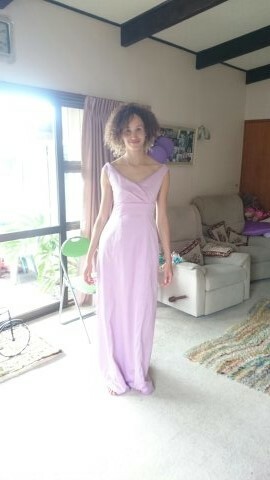 My gown for the ball (prom) when I was 17. I can't believe I can still get it on!! Not much breathing room though. I'm surprised at all the details in it like boning and an internal bodice. I was very last minute sewing this up, I made it in a week and it was only finished half an hour before the ball started... One of the pieces I am most proud of. The main reason for my trip was my Nana's (grandmother's) 90th birthday. She's really cool, she keeps up with things, she's active on facebook, has skype, learns languages online! We had a big party for her which was lots of fun with lots of my rellies and family friends. On the day of her actual birthday I went over to her place. 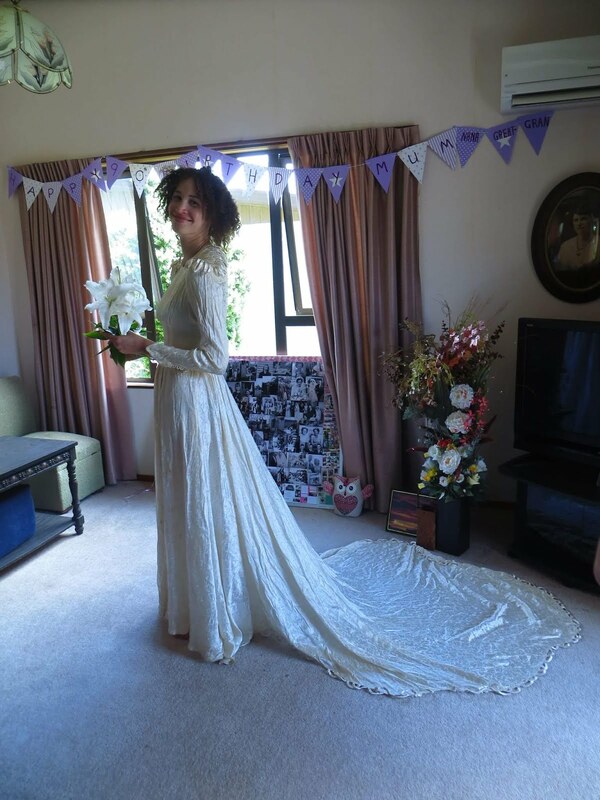 She mentioned she had found her wedding dress a few days before. 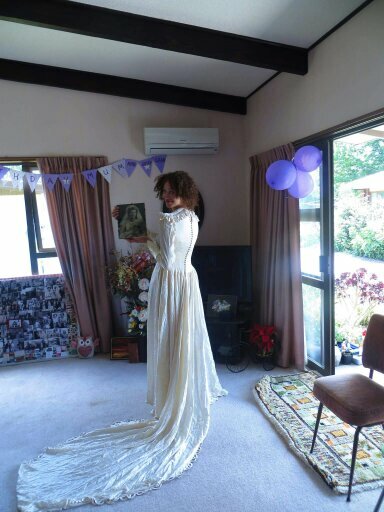 Now this is a dress I have ALWAYS wanted to see but never had because it was "up in a cupboard somewhere". I got to try it on!! My Aunty Bonnie was so patient and did up the seemingly thousands of buttons (with tiny, tiny loops). 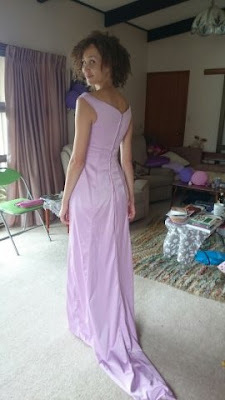 It's a little short in the front, and the sleeves could be a tad longer but the bodice fit perfectly. I couldn't believe it. My grandparents married in 1948. 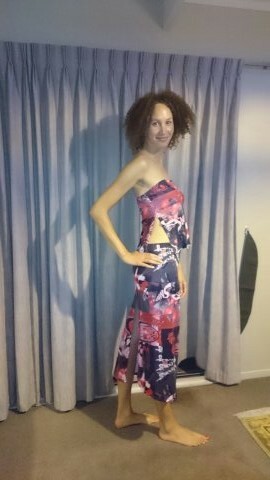 People loved her dress so much a few of her acquaintances copied it! I'm not married! Playing dress up only! The details on it are amazing. There is not much I love as much as playing dressing up!